Safety in the workplace is no new issue, in fact, the Health and Safety at Work Act was introduced in the UK in 1974. This act involves employers and their duty to protect the ‘health, safety and welfare’ at work of all their employees, visitors and general public. In all areas of employment a health and safety briefing should be delivered by a trained professional, to outline potential hazards of the workplace and how to avoid or report such hazards to the correct member of staff. As every industry and place of work is different, the health and safety process will also be different. In an office environment where staff use computers for example, considerations include the correct positioning of staff chairs, to keep the legs at a right angle to the desk in order to maintain good posture. Computer screens should also be side-on to sources of natural light to avoid glare and any strain that this may cause to the users’ eyes. In industrial environments however, where heavy machinery is used or hazardous processes are followed, the considerations will be very different. In food and beverage industries, 35% of ‘major’ injuries occur through slips and trips. From the estimated 1,300 ‘major’ injuries reported to the HSE per year, approximately 80% are slips and 20% are trips. The statistics for slips and trips is rather unsurprising when you consider the processes taking place in most food and beverage facilities. For example, in areas where there is a likelihood of food or drink being spilt onto the floor, you are likely to encounter spills that could be slippery. Aside from the spillages themselves, regular cleaning of such spills can leave the flooring wet, again causing a slip hazard. 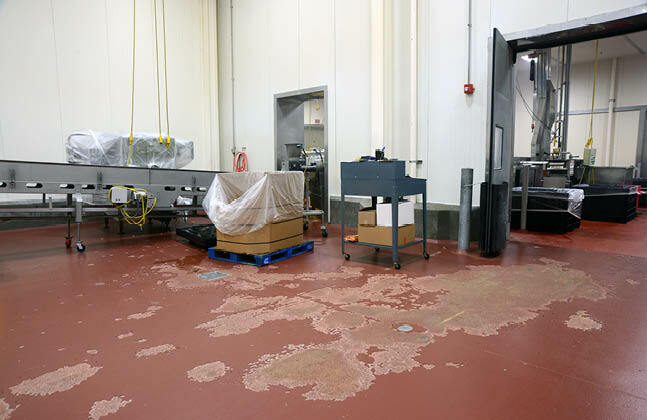 In fact, the majority of slips (90%) occur when the floor is wet with water or contaminated with food product. On the other hand, trips are slightly different, as this often includes a physical item or discrepancy that a person trips over. Most trips (75%) are caused by obstructions, with the remainder caused by uneven surfaces. It is a facility manager’s prerogative to ensure that all employees are safe at work. Aside from keeping a workforce happy to reduce staff turnover, accidents can lead to litigation if a facility does not have sufficient health and safety features in place. Whilst accidents do happen, there are several steps that can be taken to reduce the likelihood of accidents occurring. With regular chance of spillages resulting in regular cleaning, the likelihood of a food and beverage facility’s floor being wet is high. 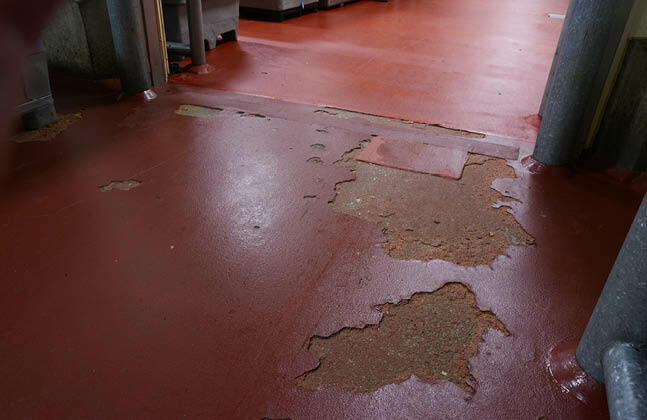 Due to this, a flooring system with slip resistant properties should be specified, especially for wet processing areas. The floor should also be installed at a pitch to sanitary drainage systems that allow any potential surface water to drain away quickly. 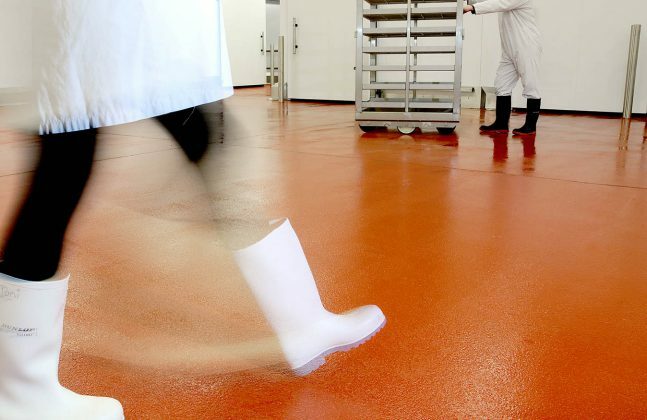 This can help to limit the chance of slipping, and also means that any possible bacteria being held in surface water is drained away quickly, reducing the risk of infecting employees or produce. Trip hazards can be caused by anything from dropped objects to cracked or uneven flooring, causing a user to misstep, increasing the chance of injury. 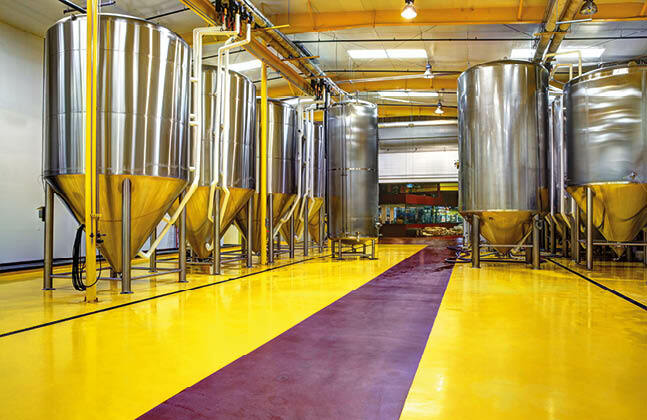 Specifying durable flooring reduces the chance of cracking or peeling over time, as the floor would be protected from general wear and tear and built to withstand abrasions from machinery, footfall and other processes that industrial environments can expect. As a general rule, the thicker the specified flooring the more durable it can be whilst decreasing the likelihood of needing repairs or replacement coatings for many years. 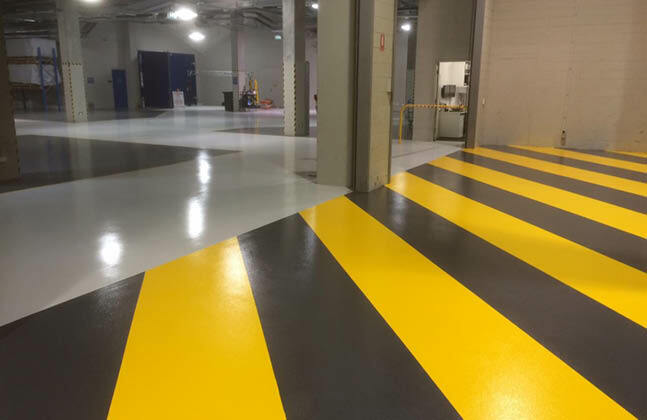 A great way to avoid trip hazards, and one adopted by several manufacturing and processing plants, is by specifying one bold coloured epoxy resin. Using a single colour increases the likelihood of being able to see dropped items more clearly. ‘Busy’ flooring with multiple colours or textures can mask dropped items, increasing the risk of employees or visitors tripping. Areas where trips are more likely to occur, such as areas of uneven flooring, ramps or steps can be clearly outlined using coloured signage incorporated into the floor. The benefit of using signage or colours within the floor’s surface does mean that you won’t have to worry about peeling tape, which can provide yet another risk of tripping. In any industry where one site is used for multiple processes, demarcation can help to divide the site up into sections, otherwise known as ‘zoning’ a space. 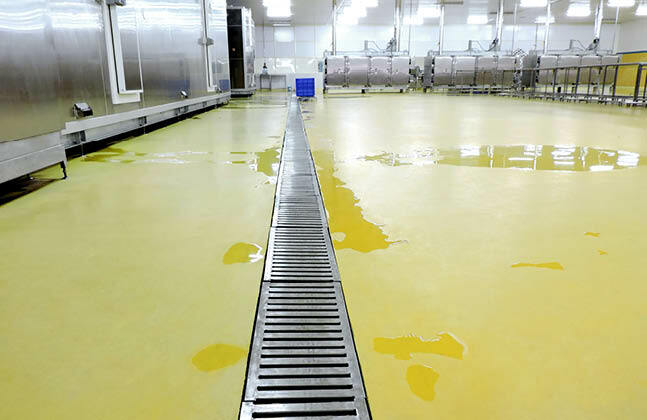 For food and beverage facilities, this could be using different coloured epoxy resins or polyurethanes for raw and cooked, or wet and dry processing areas. Providing clear zones will help employees to understand the potential hazards that could occur. As well as improving safety for employees, zoning to separate raw and cooked foodstuffs also helps to decrease the chance of contamination between zones, making the produce safer for consumers. 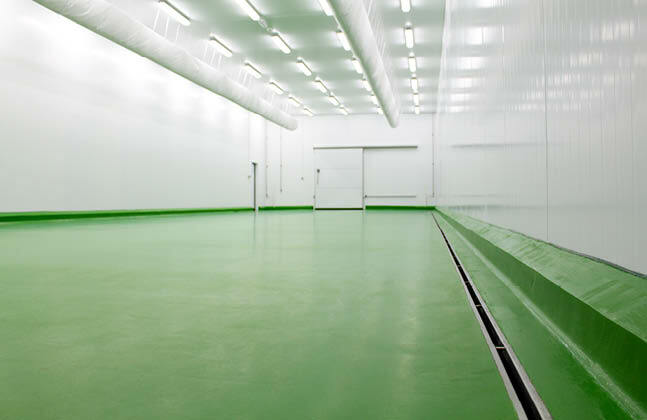 One system that works very well in these environments is the Flowfresh range from Flowcrete UK. 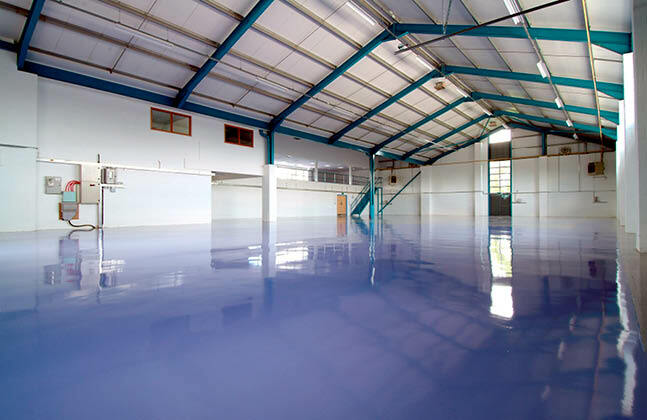 Each polyurethane screed in this range is slip resistant, chemical resistant, abrasion resistant, joint-free and is available in a variety of bright colours. A characteristic of Flowfresh that is incredibly important to the food and beverage industry is its use of silver, in partnership with Polygiene®, that eliminates up to 99.9% of bacteria on contact when paired with a regular cleaning regime. As well as helping to keep the facility hygienic and reducing the risk of bacteria growth sullying produce, this also helps to keep employees safe and working in a clean environment.